The entity consisting of parts of the "old" Chrysler has repaid the federal government $1.9 billion of the $4 billion it loaned to keep the company running following the financial crisis in 2008. The repayment, while less than face value, is "significantly" more than Treasury expected to recover on the loan, the agency said Monday in a statement. As a result of the payment, the Obama administration said no more money was owed from Chrysler Holding, which once owned Chrysler LLC and still owns Chrysler Financial LLC, the automaker's former finance arm. The repayment clears the way for Cerberus Capital Management, the principal owner of Chrysler Holding, to find a use for Chrysler Financial, The Detroit News reported. Cerberus purchased a majority stake in Chrysler and its finance unit from Daimler (DAI) in 2007. The $4 billion loan was granted on Jan. 2, 2009, in the waning days of the Bush administration, which imposed a $2 billion lien on Chrysler Financial. Chrysler defaulted on the loan when it filed for bankruptcy the following April, but the Obama administration pursued payment from Chrysler Financial, the News reported. The new entity formed after bankruptcy, Chrysler Group, run by Italy's Fiat, acquired just $500 million of the debt. Treasury spokeswoman Meg Reilly told the News that Chrysler Financial's parent, CGI Holdings, repaid the amount "with both distributions from Chrysler Financial and contributions from its equity owners." Chrysler Financial is expected to wind down by the end of next year. In addition to the $4 billion loaned to Chrysler, Treasury also provided Chrysler Financial with a $1.5 billion loan to finance consumer purchases of Chrysler vehicles, which was repaid in full with interest last July, Treasury said in its statement. The agency said its investment in "New" Chrysler wasn't affected by Tuesday's repayment. The federal government has a 9.9% equity stake and holds $7.1 billion in loans in the new company. Of the $14.3 billion in loans to Old Chrysler, New Chrysler and Chrysler Financial outstanding at various times under the Troubled Asset Relief Program, Treasury has thus far received $3.9 billion, it said. 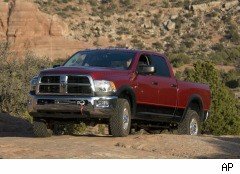 The federal government in total lent $85 billion to Chrysler and General Motors, which also filed for bankruptcy last year. Taxpayers could be on the hook for as much as $34 billion, according to recent Congressional Budget Office estimates. The eventual price tag depends on how much the government recovers from the sale of its stock holdings in both companies. In addition to its near-10% stake in Chrysler, Treasury owns 61% of GM. Though Chrysler isn't expected to conduct a public stock offering before next year, some analysts believe GM may do so as early as this fall, ahead of November's midterm elections. GM reported Monday it earned $865 million during the first three months of the ear, its first quarterly profit in nearly three years, putting it on a path toward an IPO. A public stock offering would help GM repay at least a portion of the $43 billion it still owes in bailout money.